Unions for Ryanair’s 1,800 cabin crew in Spain threatened Friday to strike in January unless the Irish low-cost airline agrees to improve work and pay conditions. It was just the latest setback for the airline, which has faced a wave of strikes in several European countries in recent months. 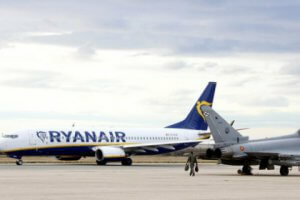 The two unions representing the staff, USO and Sitcpla, called for 24-hour strikes on 8, 10 and 13 January because Ryanair had failed to reach an agreement with them during mediation. The unions are demanding local contracts under local law rather than the Irish contracts Ryanair uses widely. It was ‘disgusting’ that Ryanair ‘continues to refuse to accept national law with all its consequences’, USO representative Jairo Gonzalo said in a statement. Europe’s biggest low-cost airline only began recognising unions for the first time in its 30-year history in December last year, to avert mass strikes during the busy Christmas period. Then on 28 September, cabin crew walked out again in Germany, Belgium, Italy, the Netherlands, Portugal and Spain and in some countries pilots’ unions also took action. The budget carrier has so far managed to clinch labour agreements with staff in several countries including Britain, Germany, Portugal and Italy. Spain is Ryanair’s third biggest market. The airline has 13 of its 89 bases in the country.